In this tutorial I will describe the configuration of an interesting network scenario that I’m sure many of you will find helpful. This scenario is applicable in many real world situations, mainly in small to medium networks. We have three different internal LAN networks which host user computers and other I.T infrastructure (servers, network printers etc). We want to separate the three internal LANs using an ASA firewall (either ASA5500 or the new ASA5500-X models will work fine). 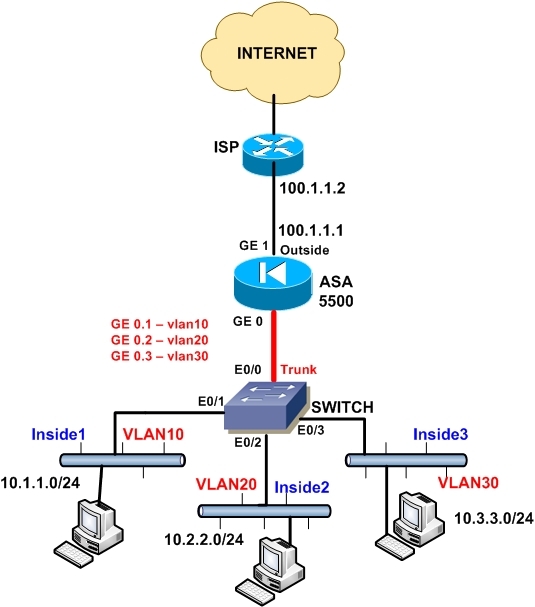 The three internal LANs will be connected on the same switch and separated in Layer2 level with three VLANs on the switch. The ASA firewall will provide internet access to all internal LANs. Also, the ASA will act as DHCP server for each internal LAN, assigning the required IP addresses for each LAN subnet using a different DHCP scope for each one. Also, we will use a single physical interface of the ASA to accommodate the three internal network security zones (“inside1”, “inside2”, “inside3”). Thus, we need to configure sub-interfaces on a physical interface of the ASA which will be connected to a trunk port of the internal switch. Each sub-interface of the ASA will act as the default gateway for its corresponding internal LAN subnet. Regarding the switch configuration, we need to have one Dot1Q trunk port connected to the ASA and also we need to configure “access ports” belonging to the appropriate VLAN for the internal hosts. Interface GE1 of the ASA (“outside” zone with IP address 100.1.1.1) will be connected to the ISP. Interfaces E0/1, E0/2, E0/3 of the switch will be configured as “access ports” belonging to VLANs 10, 20, 30 respectively. Hosts in VLAN10 will be assigned IP address from the ASA using a DHCP scope (10.1.1.0/24) enabled on “inside1” interface. Hosts in VLAN20 will be assigned IP address from the ASA using a DHCP scope (10.2.2.0/24) enabled on “inside2” interface. Hosts in VLAN30 will be assigned IP address from the ASA using a DHCP scope (10.3.3.0/24) enabled on “inside3” interface. All internal LANs will have internet access via the ASA using NAT overload (PAT) of the ASA outside interface. I have not configured communication between the three internal LANs (only internet access allowed). For ASA5505 you will need the security-plus license for the above scenario to work. Let’s now see the configurations of both the ASA and internal SWITCH.
! Configure NAT overload for the three internal LANs using the outside interface. This allows internet access. Thanks for the knowledge you always share with us. I will give it more time and see how to go about the configurations.You know am not very good at router and switch configurations but am learning a lot from you since am new in the networking field. Nice article. Would it be possible to post an article on ‘ASA running behind another NAT device and how to port-forward services such as http/https running behind ASA firewall first from internet–> Inside IP address of NAT device which is also be Outside IP address for ASA and then forward it all the way to the webserver running behind ASA ? Use OSPF routing protocol between RFC 1918, and no NAT control on ASA and what if we use NAT control on ASA? Can this be configured on gns3? For the scenario you describe, the external NAT device must be able to forward everything to the outside interface of ASA. Then, configure the ASA to do port forwarding of the traffic to the inside network. Kevynjr, yes this can be configured on GNS3 (and also you can combine GNS3 and IOU to configure switches etc). I have done it this way on ASA 5505s and on the new ASA 5506-Xs a few times in the past couple of years and can confirm that the way you have documented is also the way I basically have too. The way you structure your way of configuring is very understandable and easy for all interested in such configurations to follow. Please keep up the good work. Thanks a lot Sam for your feedback. I’m glad you like my tutorials. Do you know if it is possible to have different dns servers defined per dhcp scope? As well as assign different default gateways for each scope? Yes you can have different DNS servers per DHCP scope. For having different gateways for each scope, I haven’t tried that but my assumption is that it won’t work for each scope. If you add multiple DHCP scopes, yes you can assign different gateways as well. Thanks a lot for sharing your knowledge, Harris Andrea. My understanding is this syntax is run on the router. No, this command is run on switches not routers. In order to share the internet, it needs to to do the PAT in each VLAN Subnet in ASA device. What should be the command for the communication between the three internal LANs? On newer ASA versions you don’t need to create NAT rules between the internal LANs. You must create however Access Control Lists and apply them on the inside security zones to control the traffic between the internal VLANs. How do you config Router ISP? ISP to three Vlan ? What kind of router? What kind of WAN connection do you have?